There were 41 cases of potential wildlife crime involving badgers in Northern Ireland in 2015, according to newly released figures. Badgers are a protected species and it is an offence to harm them. The worst offender was Hillsborough, County Down, which had 10 incidents, according to Police Service of Northern Ireland (PSNI) figures. The figures are in a first report published by the Partnership for Action Against Wildlife Crime. The body includes a wide range of organisations including the police and animal welfare groups. The report says persecution takes a number of forms. It includes badger baiting, or forcing the animals to fight with dogs. There were 21 reports of such activity. Sett destruction is also happening, with equipment used to collapse or dig them out. Officers dealt with 14 such reports. The others involved reports of traps or snares. Supt Brian McKee, the PSNI's lead on wildlife crime, said ignorance was not an excuse. He said the terms of the legislation "does away with the defence that it was thought there was a non-protected species in the sett, for example a fox". The possible sentences for badger persecution under the Wildlife Order include a custodial sentence and a fine of up to £5000. Peter Clarke of the NI Badger Group said the first report would help highlight crime hotspots and raise public awareness. Brendan Mullan of the Ulster Society for the Prevention of Cruelty to Animals (USPCA) said the report would help focus resources to catch those involved in badger baiting and other persecution. 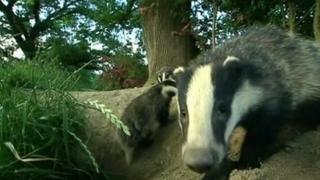 "There are no winners in this, the dogs lose and the badgers lose, both suffering horrific injuries or death," he said. It is believed the level of badger persecution is under-reported in Northern Ireland. Earlier this year, a man was fined and two others cautioned after a badger sett was destroyed in the Carnreagh area of Hillsborough in 2015.